One way to celebrate May the Fourth is by watching one of the most recognizable and iconic images in Star Wars history happen for the first time ever. Namely, you can now watch a scene from Solo: A Star Wars Story in which Han Solo and Chewbacca first fly the Millennium Falcon together, solidifying a lifelong partnership in the process. In a new clip from Solo: A Star Wars Story released on Friday, May the Fourth, we get the full scene in which Chewbacca reveals that he’s 190 years old to Han (the one we saw in the trailer from early April.) Han’s flying the Falcon with Qi’ra in the copilot’s seat with Lando and L3-37 presumably offscreen. They’re being pursued by Imperial TIE fighters when Han says, “We need to divert auxiliary power to the rear deflector shield!” Qi’ra agrees but clearly has no idea what she’s doing. It’s then that Chewie takes charge, roaring as if to say, “Y’all are useless! I got this.” He punches or flips about seven buttons and switches to divert the shields and then Qi’ra gives up the co-pilot seat entirely. 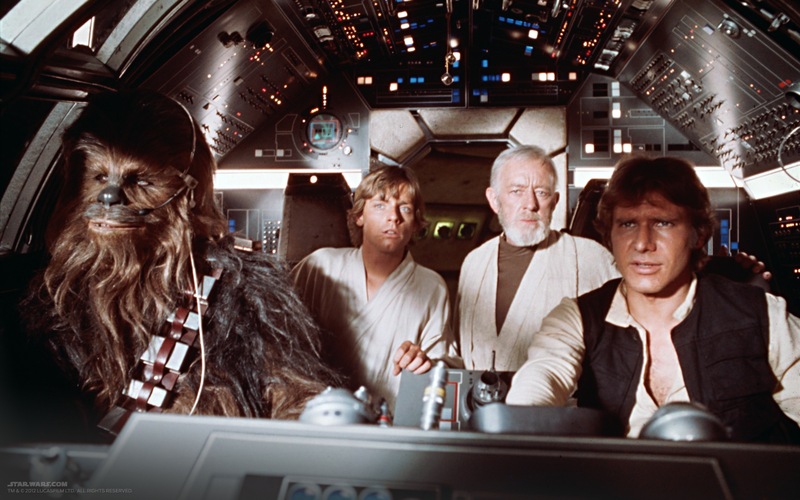 Chewie sits, the music gets louder, Han smiles, and they blast off. There's just something special about seeing Chewie and Han in the 'Falcon' cockpit. Maybe it’s that damn sly smirk Han gives Chewie right when he sits down, or maybe it’s the way the music swells at exactly at the right moment, but this extended clip is enough for even casual fans to get the chills or maybe shed a tear. It’s easy to look at Solo and think of it as “The Han and Lando Movie,” especially with Donald Glover stealing the show as Lando. So far, we haven’t really seen enough of Chewie and Han together to remind us that this is their joint origin story at the same time. In a really morbid way, seeing them bond in this scene just makes you think about Chewie’s anguished cry in The Force Awakens when he had to watch his friend get murdered right in front of him. Solo: A Star Wars Story hits theaters on May 25, 2018 and tickets are now on sale.